Turkish built gulets for sale either classic design or modern design are considered to be very seaworthy and comfortable with spacious interiors, Luxury Gulets for sale carry the characteristics of both luxury amenities and spacious comfort of a motoryacht and the silent serenity sailing of a sleek sailing yacht . We can propose you the most suitable gulets for sale available in the market either classic design or modern built gulet which might serve yours expectations, west system epoxy lamination hull or high tensile steel hull gulets built with Rina or Loys’S standards . 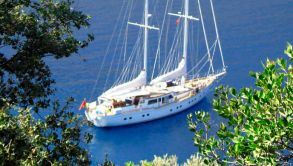 You are cordially invited to visit and carry out a seatrial with these beautiful gulet for sale , just let us know the size and price range you might consider and let us handle the rest for you to assure that we can certainly propose you a gulet for sale to meet your budget and technical requirements. In fact, the time is always ahead of us, so that you need to call us and pay us a visit to our country in order for our captains to accompany you to the marina to see your gulets for sale Turkey in person. By doing this, we protect our clients’ interests to let them make sure that they are not dealing with spam as it happened in different parts of the world. We can react with your inquiries as soon as possible. Do not hesitate to consult with our captains about whatever you think is important for your gulets for sale Turkey. Sending your email is very important if you are interested in other options that are not there in our portfolio. We have many gulets for sale that we did not show in order to give you a chance within limited options.